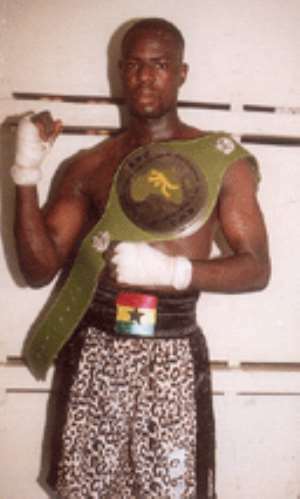 Accra, Dec 15, GNA - James "Hot Ice" Toney, Ghana's World Boxing Council (WBC) International and Commonwealth middleweight champion said he was ready to defend his titles against any credible opponent any time, anywhere. Speaking to the GNA Sports at the Attoh Quarshie Boxing Gym at James Town in Accra on Wednesday after a hectic training session, the double champion said he was in the best of shapes and would like to defend any of his titles against the best contenders available. He called on promoters to match him up with "a very good challenger" before the end of the first quarter of next year, adding that the year 2005 would be a landmark one for him because "it will be my turn to be on top." "Bernard Hopkins and the other big guys have had their turns on the big stage and 2005 will be my turn to get all the attention," Toney said, as he wiped sweat from his forehead with his bandaged right hand. He said he was insisting on a credible opposition for his title defence because he would like to use such a fight to entice the big promoters to give him the opportunity to announce his arrival as the boxer to beat in the middleweight class. The Commonwealth champion praised the trainers at Attoh Quarshie Gym for putting him in the kind of shape that he had never been before, adding that his punching power, his hand speed and his precision have gone through a dramatic transformation, making him a much better boxer now than he used to be. "Alloway, my coach has taught me many new things and I am now ready to fight anybody in the division including champion Hopkins or Oscar de La Hoya," he said. He thanked Anthony Kermah, his manager and the entire Kermah family for guiding his career this far and promised them that he would work assiduously to become the undisputed champion in the middleweight division. Toney called on his fans to pray for him to get a world title chance so that he would give them the opportunity to celebrate another world title for Ghana.